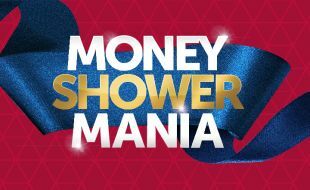 Grab some money or FreePlay worth of R60,000 with our Money Shower Mania promotion. As a Rewards Cardholder all you have to do is actively play Slots or Tables between 3 October and 30 March 2019 to earn points and draw entries. 6 tickets will be drawn for every draw. Winners will be given 90 seconds to be verified with positive identification (SA ID, Driver’s license or valid passport), ticket receipt and Goldfields Rewards card. Guests will be given the opportunity to pop a balloon to determine their seconds in the Money Shower to grab the money or FreePlay. When the guest is done in the Money Shower, guests will be given another opportunity to pop a balloon which will determine whether their prize Stays the same, Doubles or Triples. Participants earn points by playing slots or tables whilst using Goldfields Rewards cards. 100 points will entitle the cardholder to 1 ticket, 200 points to 2 tickets, 300 points to 3 ticket and so forth. Tickets will not be capped. Tickets to be printed at the e-host. Guest to retain their receipt ticket and place printed tickets in draw bin provided on the promotional stage. 6 Winners will be drawn from the entry bin and announced by the MC. When a winner catches the money, it has to be put into the slot on the side of the device, otherwise you cannot claim the money if it is not in the side box. No flowing skirts. Not barefoot ever. No high heels. Winners enter the Money Shower device at their own risk. All Participants are required to be present on the respective dates/times to be eligible for a Prize: Provided that if a participant elects not to be present in person when the winner/s are announced, the participant may nominate another person who has been duly authorised in writing to attend the draw on behalf of a participant in the form of a Proxy as determined by management, the details of which will be available at the Customer Services Desk. Participants must register to decline to be present at the draws in person. No person shall be permitted to act on behalf of a participant to exercise this rule. Positive and acceptable form of identification must be presented by relevant parties when completing the Proxy process. Participants or duly authorised representatives (Proxys) shall be required to present themselves within 90 seconds from the time of announcement, and must produce the valid ticket entry and positive and acceptable form of identification e.g. a South African I.D./South African Driver’s License/Passport or other official form of identification as approved by the casino and any other details as required. A redraw will occur should Participants or Proxys not present themselves within 90 seconds. Authorised representatives or a participant shall not be entitled to any prizes and shall not take receipt of prizes accruing to the Participants they represent. Cash Prizes are to be collected and signed for receipt thereof by the relevant Prize Winner (not representative), as the case may be, within 15 days from the date of the draw from the casino where the prize(s) were won. Once a prize winner has been announced, such winner shall be eligible for a maximum of 2 (two) further prizes (a Maximum of 3 prizes in total) in that draw should his/her ticket be drawn again. In such instances where a winner has been eligible for a maximum of 3 prizes, a re-draw will take place.